There’s a community about half way between Byrdstown and Jamestown called Double Top where the scenery is unbelievably breathtaking. It would be hard to say how far a person can see in all directions from that area. By the way, I want to find out how that community got its name, and I'd appreciate hearing from anyone who knows how it came about. It is in the Double Top community that a lady by the name of Mrs. Clara Hinds has lived all her life. Her birth certificate may say she’s 86 years old, but it’s hard to believe that could be right. She doesn’t look nor does she act much more than 70. Here’s a little bit about her life. Clara’s maiden name was Choate. She is the daughter of Marvin Choate and wife Nenah Bowden Choate. The Choate home was in the Little Crab community. A total of eleven children were born to Marvin and Nenah whose names were: Minnie; Wilbern; Willis; Willie; Clara; Walter; Grace; and Pauline. One infant died at birth and two other children died at a very young age. When Clara was just six years old, and Pauline was only one year old, their mother passed away. After the death of their mother, the responsibility of caring for the younger children was passed on to Minnie. She not only did the cooking, but did the washing and ironing for all the family. The washing was done on a rub board and the ironing was done by heating the iron on the wood cook stove. During the period of time the WPA program was underway, Marvin Choate worked for while under that program. Each time Marvin got a paycheck from the WPA, Clara said the family thought they were really living "high on the hog." Clara described their growing up years as rough, but they had a good time. Some of their favorite games they played as children were Ring Around the Rosie, and Annie Over, played with a homemade ball made from strings. Playing marbles was another thing they enjoyed. The boys made their own marbles by chipping out a limestone rock that was placed in a hole drilled in a flat rock where water from the spring ran over it, and smoothed out all the rough edges as it tumbled around. Roaming the hillsides was something else they did, not just as children, but Clara said that was something she enjoyed doing up until just the last few years. She described some of the hillsides she liked to explore as "being steep as a cat’s face." Stick weeds served as their stick horses, and making a playhouse underneath the kitchen floor was something else they enjoyed. Moss was used to make small beds with, and mud pies were made and served on broken pieces of dishes. What the Choate family had to eat they grew themselves. They had cows to milk, and from the milk, they churned their own butter. They raised hogs for meat, and the eggs from their chickens were taken to Pete Wright’s store across the river. Sometimes when the river was up, Marvin Choate would take the children across in a canoe, and at other times, they would wade across, or ride a mule to the store to get their staples. They grew sweet potatoes that were wintered over in the loft above the fireplace of their house. Irish potatoes, cabbage, and turnips they grew would be placed in a hole in the ground covered first with grass, then dirt, and finally boards would be stood around the dirt mound over the vegetables. This was the method used to preserve those vegetables during the winter months. Only a small amount of dirt and grass would be taken off each time either potatoes, cabbage, or some turnips were taken out of the hole in the ground, and then the dirt and grass would be put back on the mound. The Choate children went to school at Little Crab, but Clara didn’t go past the second grade. After Minnie got married, Clara was needed at home to see to the chores. When she was just 16 years old, she met the man she would spend the next 44 years of her life with. That man was a fellow named Oakley Hinds whose parents were Pete and Fannie Hinds. He was one of eight children, whose names were Marion; Ruby; Lonza; Ogle; Charlie; Lois; and Webster. Oakley and Clara met while attending church services at the United Baptist Church at Little Crab. Oakley asked her if he could walk her home after church services one Sunday, and that began a courtship for next two years. Their courting days would usually be at either church services, or Oakley would come over to Clara’s house. On the 8th day of September, 1940, Clara and Oakley got married on the front porch of the Choate home. Clara’s uncle, Clarence Choate, a justice of the peace, performed the ceremony. On that very same day, Clara’s father also got married again, this time to Hazel Choate. None of the children were very happy about their father remarrying, and it was around that time that Willis decided to find a place to rent. When he did, Walter, Grace, and Pauline went to live with him. It was Willis who paid for Walter, Grace, and Pauline to go on to high school. Grace and Walter were the only children in the family who obtained a high school education. It was Clara’s husband, Oakley, who taught her how to read. 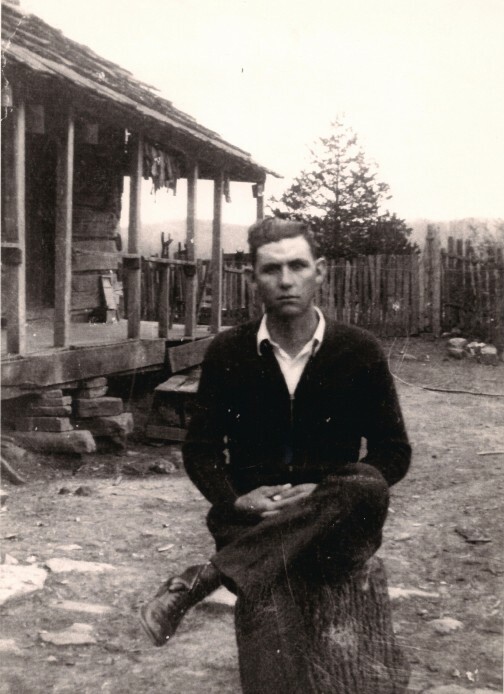 Oakley Hinds sits on a stump in the front yard of his family home. This picture was made around 1940. Over the years, Oakley and Clara Hinds’ family grew to include three daughters, Norma Dean, Sue, and Gail. The daughters were raised at what was known as the Freeley Scroggins place in Double Top. For the first four or five years they lived there, Mrs. Scroggins lived in part of the house, and the Hinds family lived in the other. Oakley worked odd jobs, did some farming, raised a tobacco crop, and later worked in a rock quarry for Dr. Perry Sloan. His fine craftsmanship as a stone mason can be seen in the rocks used in the construction of Grider Hill Boat Dock. A great number of rocks he quarried out have been bought and taken to many other states. Much of the stone work around Star Point dock was also as a result of the hard labor done by Oakley during the time it was owned by Mrs. Tommye Copeland. Oakley was paid seventy-five cents a foot for cut stone, or $25.00 to $35.00 a ton. The Hinds children attended grade school at Hinds Chapel and Broaddoor elementary schools, and then went on to attend high school at York Institute in Jamestown. 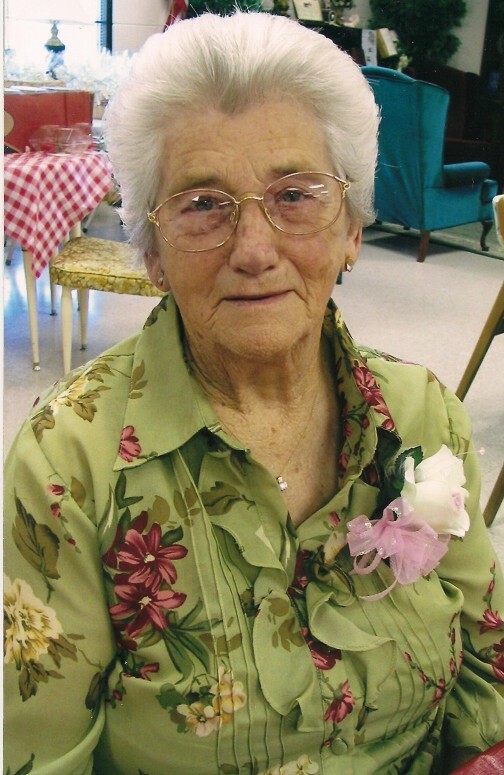 Before the children were nearly grown, Clara got a job at a shirt factory in Jamestown, and then later, worked at Fentress Industries, a factory that made coats. In 1972, Clara and Oakley moved into a new home they built just down the road from the house where they raised their children. Clara was 61 years old when she learned how to drive. 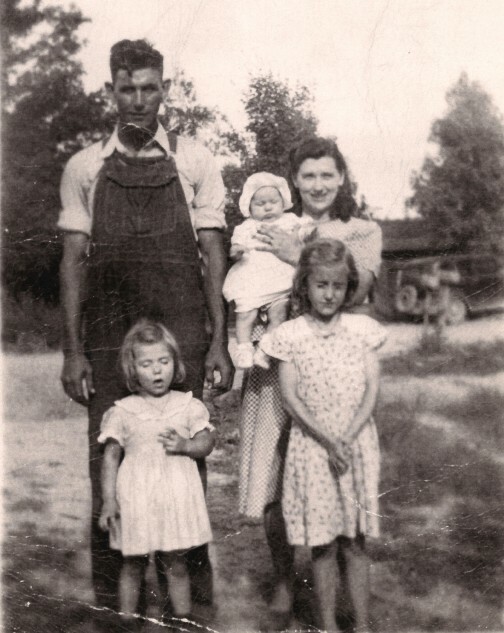 The Oakley and Clara Hinds family with daughters Norma Dean, the oldest, Sue, the middle daughter, and Gail, the baby of the family. Since Oakley’s mother had been a mid-wife, the use of herbs was something he had always believed in. He would often dig herbs just for family use. A remedy that was good for bad colds was to drink rag weed tea. Yellow root and black snake root were two other very useful herbs, even though Clara said it is very hard nowadays to find black snake root. In 1983, Oakley was diagnosed with cancer, and in April of 1984, he passed away. He and Clara had been married for 44 years. After Oakley’s death, it was very hard for Clara to keep the wolf away from the door, and to supplement what little income she had, and to help make ends meet, she would often quilt for people. Quilting was something she taught herself how to do. Even though she no longer quilts for individuals, she does so now just for her own enjoyment. The day I visited with Clara, she had a quilt set up in her living room she was working on. She once made a quilt by a pattern called "Dusty Rose" that had over 3,000 yards of thread in it. She sold that quilt for $1,000.00. After Oakley passed away, Clara had the opportunity to do some traveling thanks to a first cousin by the name of Charlie Bowden. Charlie asked Clara and Minnie to go on a month long trip with him out west with the understanding that the only expense the sisters would be out was for motel rooms. He would pay for all other expenses while they traveled. The trip included visiting in Oregon and Texas which Clara said she enjoyed very much. At one point along the way, Minnie, who had grown tired of McDonalds fast food, was wishing for some home cooked "tators." Clara’s advice to Minnie was to "Forget tators ... let’s try something new!" And as time when by, word got around about the homemade stack cakes, jams, jellies, and fried apple pies Clara makes, and she began to sell those too. The art of making a stack cake Clara learned from her sister, Minnie, when she was only 14 years old. She dries all of her apples she uses in the stack cakes and fried apple pies. During the summer and fall of 2008, Clara put up a total 55 gallons of dried apples. Boxes filled with fruit jars containing homemade jelly, preserves, and jams sit in her dining room waiting to go home with prospective customers. A recent photograph was taken of Clara Hinds during one of her visits to the Senior Citizens Center in Jamestown, a place she really enjoys going to. Up until this past year, Clara has always participated in the 127 Yard Sale every August. She has everything from beautiful snow, white linens, handkerchiefs, tablecloths, napkins, as well as antique dishes included in the items she has for sale, along with all her homemade baked goods and canned items. She has also had a booth at the Crossville Flea Market many times. She loves attending the activities at the Senior Citizens Center in Jamestown, and says she would go more often than she does, but with high gas prices, she just can’t afford to. In spite of the fact that she says she doesn’t have any education, she’s quiet a special lady. To me, the accomplishments she’s made in life far exceed any piece of paper awarding someone a degree in this or that. I know there are many who would agree with me when I say she’s definitely a gifted artist when it comes to those beautiful handmade quilts and her wonderful homemade baked goods. A drive to Clara’s home in a very rural area of Fentress county is not only the most beautiful trip that can be made around here, but is well worth it just to get a taste of those terrific fried apple pies that are my favorites.